It reported that Shanghai is researching and planning the connection of the Inter-city passenger rail lines among the near six county-level cities of Jiangsu and Zhejiang. This plan consists of the line that "Pudong of Shanghai to Chongming to Qidong of Jiangsu". 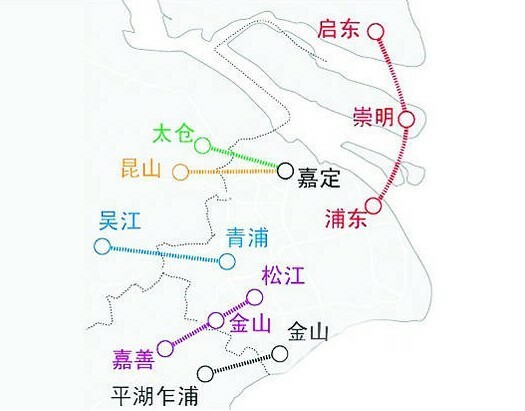 Excepting the rail line that "Pudong of Shanghai to Chongming to Qidong of Jiangsu", Shanghai also researched and planned another five lines, they are"Jinshan to Pinghu, Zhapu of Zhejiang", "Songjiang to Jinshan to Jiashan of Zhejiang", "Qingpu to Wujiang of Jiangsu", "Jiading to Kunshan of Jiangsu", and "Jiading to Taicang of Jiangsu". Among them, the planed line "Jiading to Kunshan of Jiangsu" has been already approved and extended through the line 11 of Shanghai. The economy will not has a certain development until the excellent transportation is formed. The plan of Inter-city passenger rail lines is surely a good news to Shanghai Shibang Machinery. In the may,2010, the Qidong manufacturing base of Shibang Machinery which has an area of more than 70000 square meters was under formal construction. At the present, this big manufacturing base has already put into service and it will be used for the high technology production of the environmental protection equipments, large crushing and sand making equipments and precise micro powder equipments that have the international leading level. However, Qidong of Jiangsu which with the equipment manufacturing industry as a traditional strengths all the time, will be mainly forged to the equipment manufacturing base of Jiangsu. This time with the moving into of many excellent enterprises including Shanghai Shibang Machinery, will surely bring the new vitality for the development of high-end equipment manufacturing. Along with the traffic opening of Chongqi Bridge and the planning and construction of the rail lines with Shanghai, Qidong will totally blend into the "one hour economic circle" of Shanghai, and even surely become the bridgehead for connecting Shanghai and Hangzhou, extending the north of Jiangsu and jointing Shanghai.